Shavuot - a wine and cheese party. On Shavuot, the holiday honoring the receiving of the Torah at Sinai, we make an exception to the general rule of the rabbis that holiday joy requires meat and wine. This is the time of year that pulls out the dairy recipes. One of the many reasons offered for this tradition on Shavuot is that after receiving the Torah, the Jewish people could not eat meat products immediately, since the meat they had was not prepared in accordance with the newly-given laws of animal slaughter, leaving them with only dairy products to eat on the day of revelation. It goes without saying that wine always plays a significant role on our holidays, and it makes Shavuot an appropriate occasion for a wine and cheese party. Cheese and wine have a great deal in common, and they have been enjoyed together since biblical times. Both are products of fermentation and may be consumed while fresh and young or, in their more complex forms, when they are aged and mature. But which cheese to serve with which wine? The possibilities of pairing cheese and wine are endless and there are no hard rules as to which wines should be served with particular cheeses. A quick glance at any supermarket's dairy shelf is enough to get us confused with the abundance offered. Making a perfect match calls for much care and thought, but it is also a matter of your own personal taste. You may prefer one cheese with a particular wine, while others may like an entirely different pairing. However, harmony should always exist between the cheese and the wine, and they should have similar intensities. The goal here is balance - strong and powerful cheeses should be paired with similar wines, and delicate cheeses with lighter wines. If you plan on having some friends over to celebrate the holiday, my recommendation is to be in a mood for experiment and enjoyment, while the key word is variety. Offering a wide array of both wines and foods will make your party interesting and lots of fun. • Mild cheeses go well with fruity reds; strong, aged cheeses with full-bodied reds; blue cheeses with sweet wines; goat cheeses with whites or fruity reds; and creamy cheeses with champagne. • Soft-white cheeses: For mild cheese that is slightly sharp and salty, try a sweet wine such as Riesling and Gewürztraminer. The more solid bries require a full-bodied, fruity red like Pinot Noir or even a rich white, such as Chardonnay. 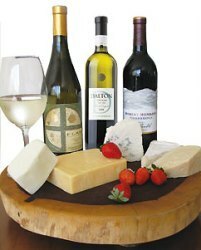 • Fresh cheeses: Try fresh, light, crisp wine like Sauvignon Blanc. Red wines will be too heavy and will overpower the cheese. • Semi-soft cheeses: Full-bodied whites or light, fruity reds. The firmer, distinctively flavored cheeses need wines such as Chianti or Merlot. • Hard cheeses: These cheeses have a great range, from mild to strong and sharp, so most of the wines here are a potential match. However, the stronger the cheese, the more full-bodied the wine. The mild ones will go nicely with something red and fruity, maybe Merlot, while the medium and stronger ones can be paired with Cabernet Sauvignon or Shiraz. • Aged cheeses: The grand finale to any cheese and wine pairing is a blue-veined cheese paired with Port. It produces a toffee-like characteristic, which is a surprisingly delicious experience.